Say hello to Samsung‘s brand new Galaxy A smartphone, the Galaxy A80. 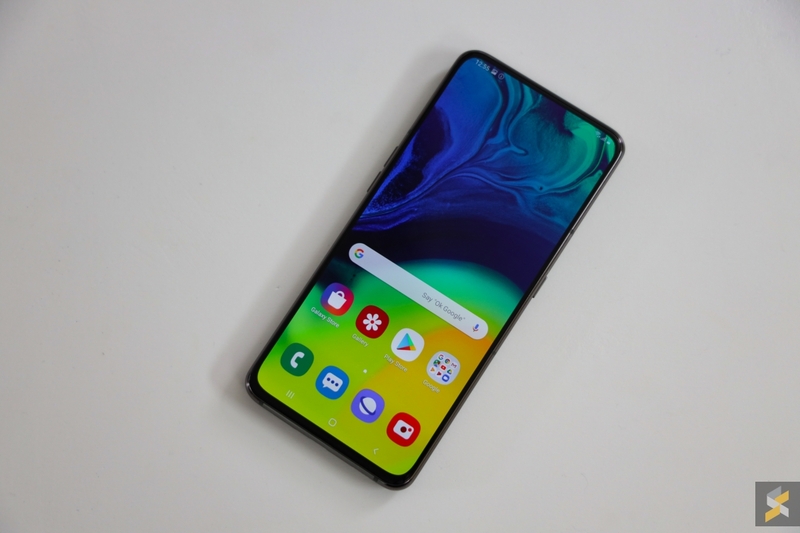 As far as hierarchy, the Galaxy A80 sits right at the top of the current crop of Galaxy A smartphones, and it also comes with a fancy new motorised camera module. 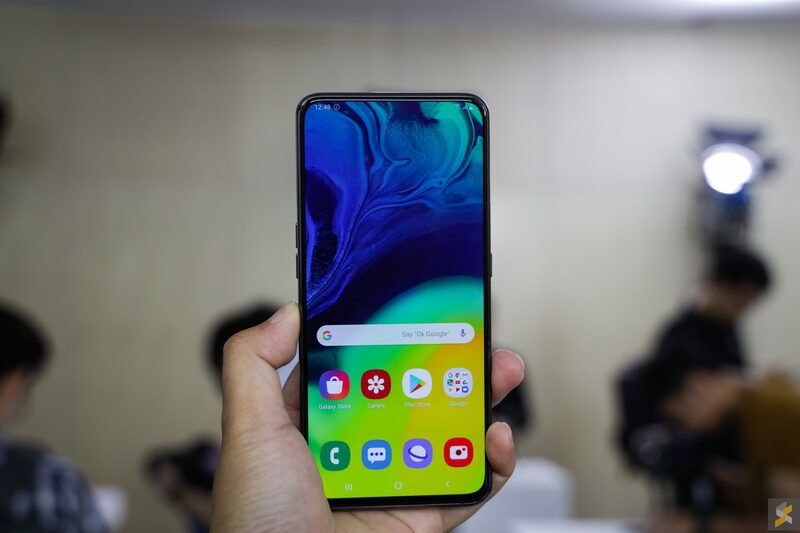 The Samsung Galaxy A80 is one of the biggest Galaxy A smartphones to launch so far as it features a massive 6.7″ display that pushes a resolution of 2400×1080 pixels (Full HD+). It’s an AMOLED panel and it is actually Samsung’s latest infinity display, simply dubbed the New Infinity Display. 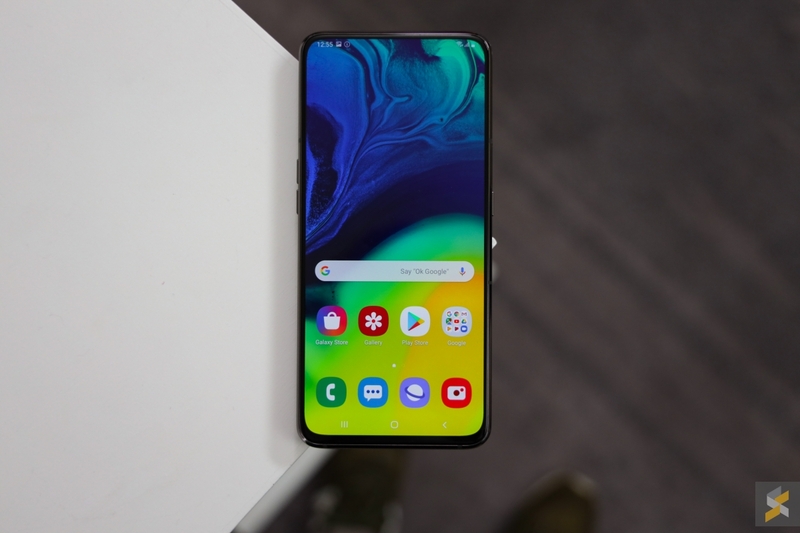 If you’re wondering what’s so new about this display, you may have noticed that on the Galaxy A80, there is no Infinity V or Infinity U notch at the top, nor is there an Infinity O punch-hole at the corner. Instead, the front is all screen with really slim bezels all around, plus a small chin at the bottom. 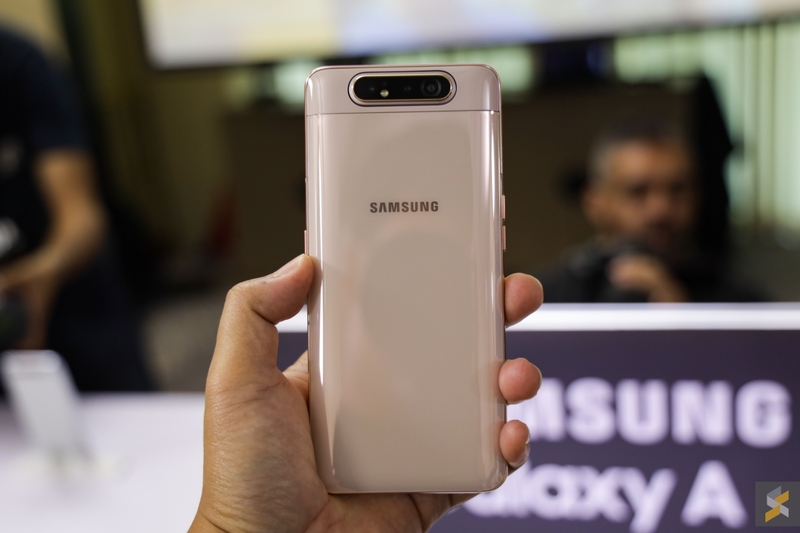 This also means that the Galaxy A80 doesn’t have a selfie camera up front for you to take pictures with. 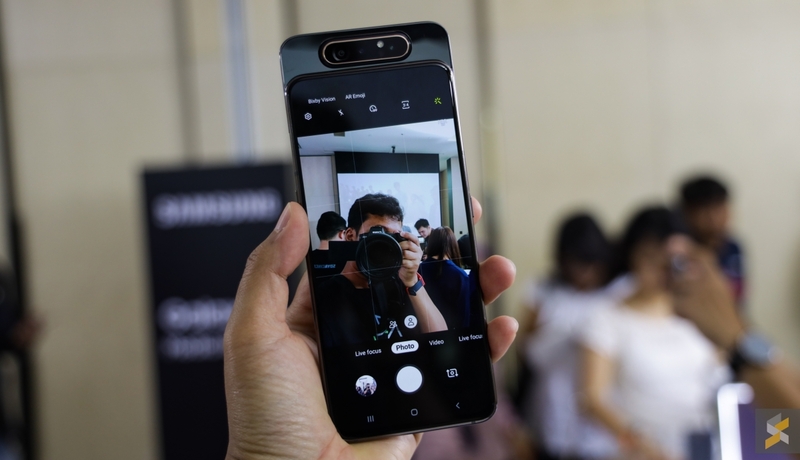 If you want to grab a selfie, you’ll have to engage the Galaxy A80’s party piece, which is a motorised main camera that can pop up and flip around to face the front. This main camera module is actually a triple camera array consisting of a 48MP f/2.0 wide camera, an 8MP f/2.2 ultra-wide camera and a 3D Depth camera. Fancy camera module aside, the Galaxy A80 is also the most powerful handset in the new lineup of Galaxy A smartphones. Inside, it’s powered by a Qualcomm Snapdragon 730G processor that’s mated to 8GB of RAM and 128GB of internal storage. Keeping the lights on is a 3,700 mAh battery that has support for 25W fast-charging via USB-C. It also features an in-display fingerprint scanner, but it’s an optical scanner, not an ultrasonic one like you’d find on the Galaxy S10. Unfortunately, there isn’t any face unlocking because there’s no front-facing selfie camera. This phone also doesn’t feature stereo speakers, lacks support for microSD storage expansion, and tragically doesn’t come with a 3.5mm headphone jack. 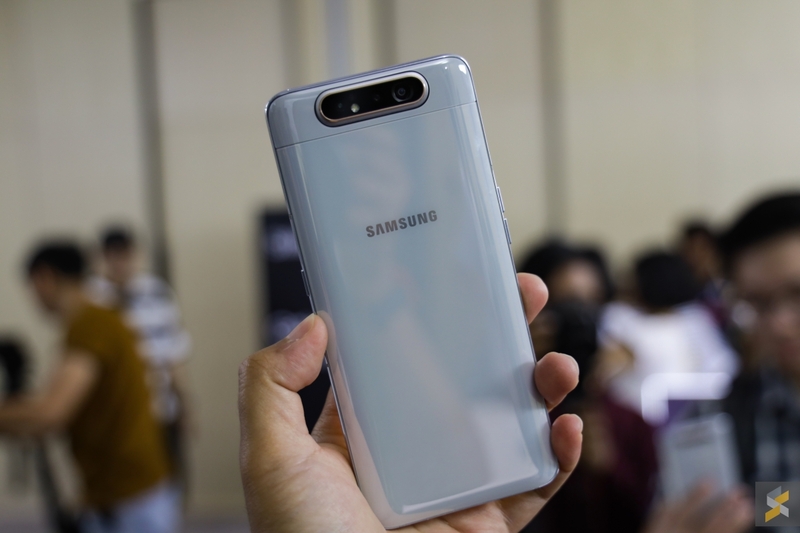 Besides the A80, Samsung also showcased the Galaxy A70 which also comes with a large 6.7″ Full HD+ Super AMOLED display up front. 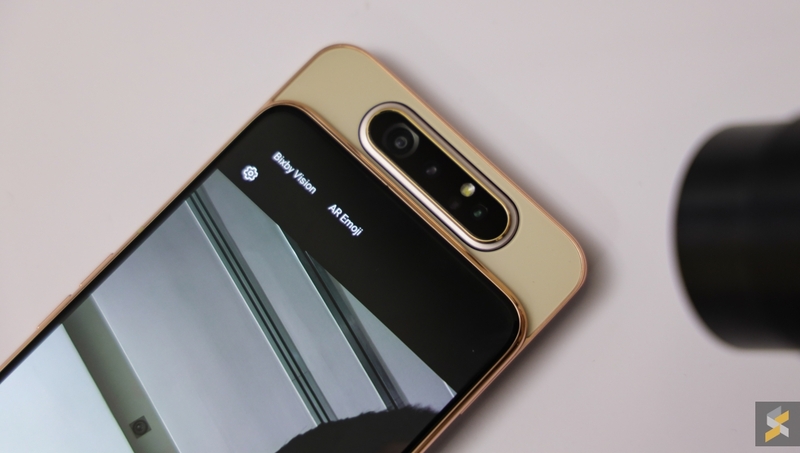 However, this device comes with a notch that houses the 32MP f/2.0 selfie camera, as well as a 32MP+8MP+5MP triple camera setup at the back. Check out our announcement post to learn more about the Galaxy A70. 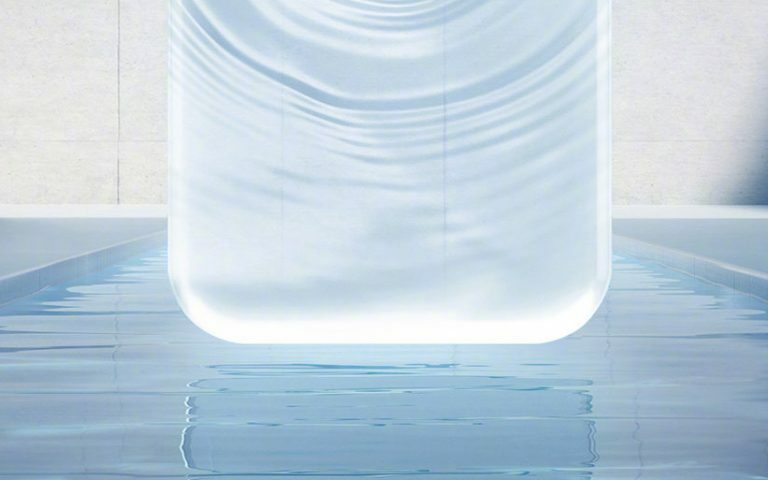 Samsung’s Galaxy A80 will be launching globally on the 29th of May 2019. 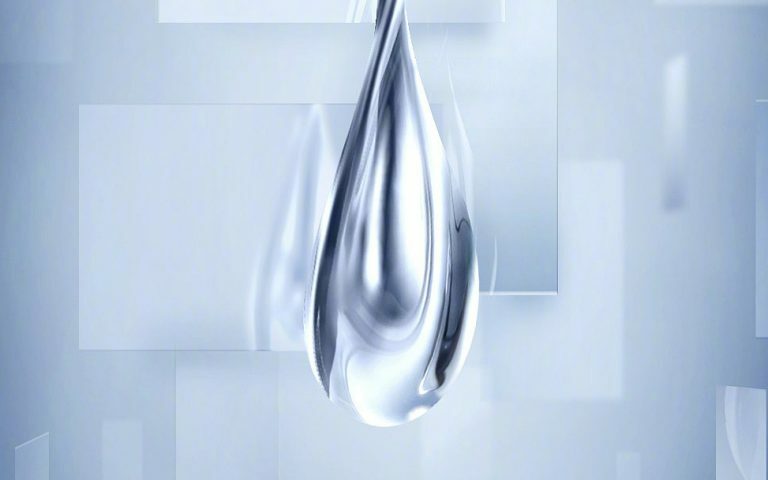 Meanwhile, the Galaxy A70 will launch globally on the 26th of April 2019. Unfortunately, there are no details on the pricing nor is there an exact date for when it will launch in Malaysia. We’ll update this post as soon as we have that information.